The Welsh word Tau means "to be silent." Tau's chic minimalist styling in clear glass and monochromatic labeling creates a strikingly contemporary, quiet statement. Tau is the anti-Evian, in the sense that it is stylistically New Age, and the stuff inside the bottle is consistent with the New Age packaging image. At 78 mg/l of Calcium, 24 mg/l of Magnesium, and a sensational 13.5 mg/l of Silica, the water has seriously good quality - and it manages to deliver the goods with a neutral pH, very low-TDS, and negligible Nitrates. In all, a truly brilliant water whose time has come. 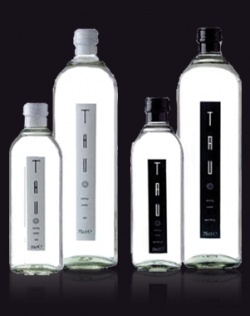 For brands in this quality standard of water and packaging, Tau also represents a superior value.